Welcome to Rosie's Living Kitchen! Scroll down to get your FREE recipes! Want to eat healthier but don't know where to start? 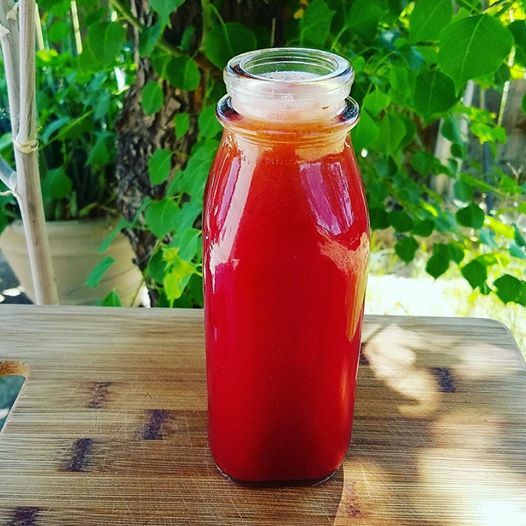 The Seven Day Juice & Meal Plan is now ready for you! Just click the button below to get your copy! First make your smoothie in a blender. Blend up your smoothie then pour into a pretty bowl. Place the following into your blender and blend up! Add water to fill the blender to about 1/4 full. As you are blending add more as needed. I hope you enjoy this! TIP: You can place a jar of this into the freezer for a few hours and it is like a slushy to enjoy later! Remember to subscribe to my newsletter so we can keep in touch and I can keep you informed of new recipes and blogs! Have a super healthy day friends! 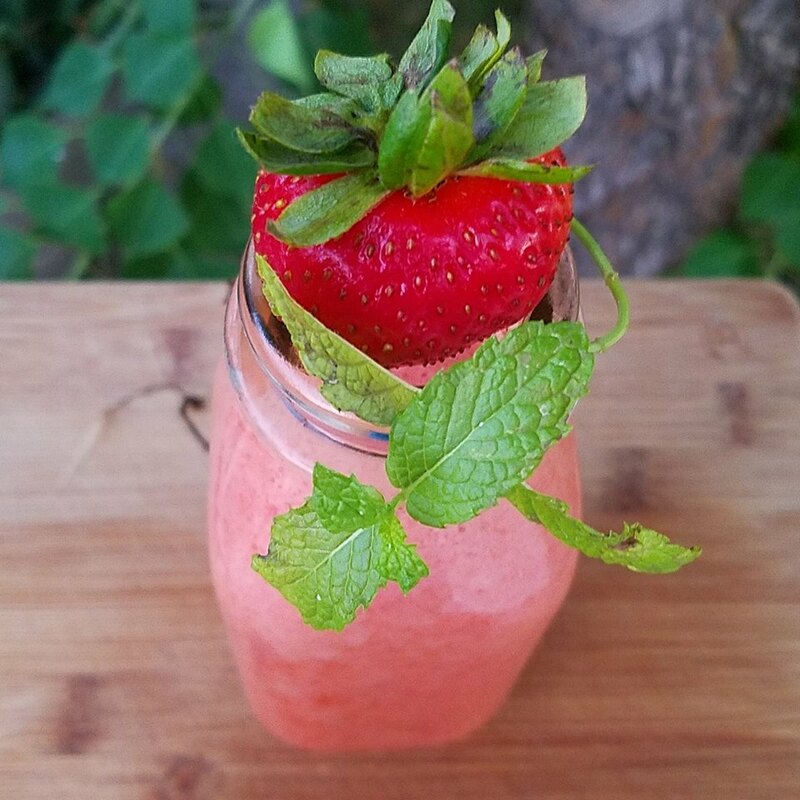 Here is how I made this Delicious Refreshing Summer time drink! First I added 2 fresh squeezed Lemons to my blender (I like it tart and lemony but you may only want to add one lemon). Then I added 5 med/ large fresh strawberries, 3 large frozen strawberries and 1 cup of frozen pineapples. Next a few Mint leaves and 1/2 tbs raw honey or monk fruit powder for natural healthy sweetness! And 1/2 to 1 cup of coconut water to get it blending but add it slowly so you get your desired thickness. 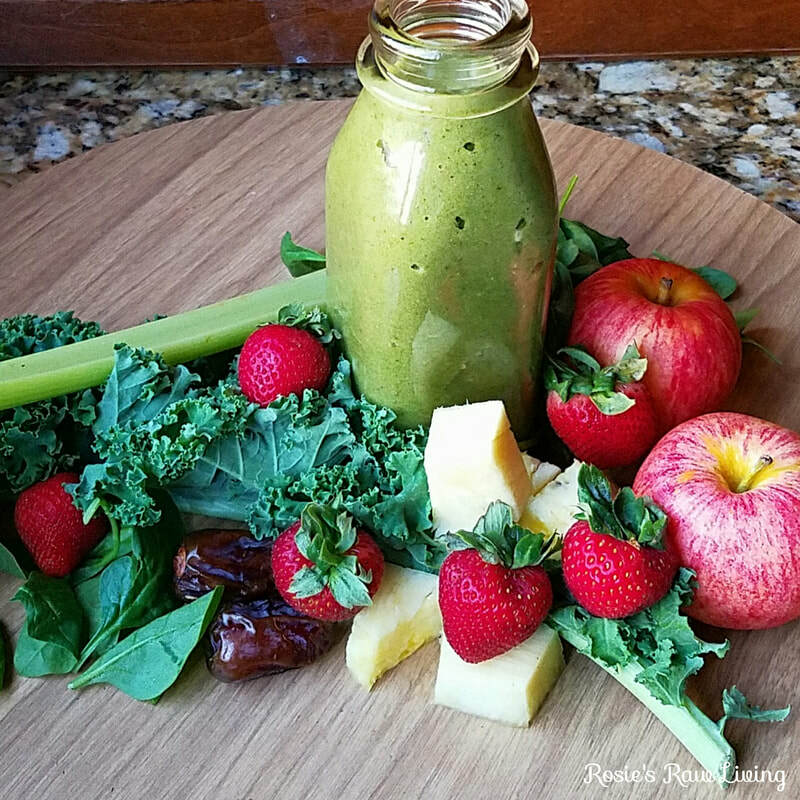 Blend it up and serve! ​Recipe! 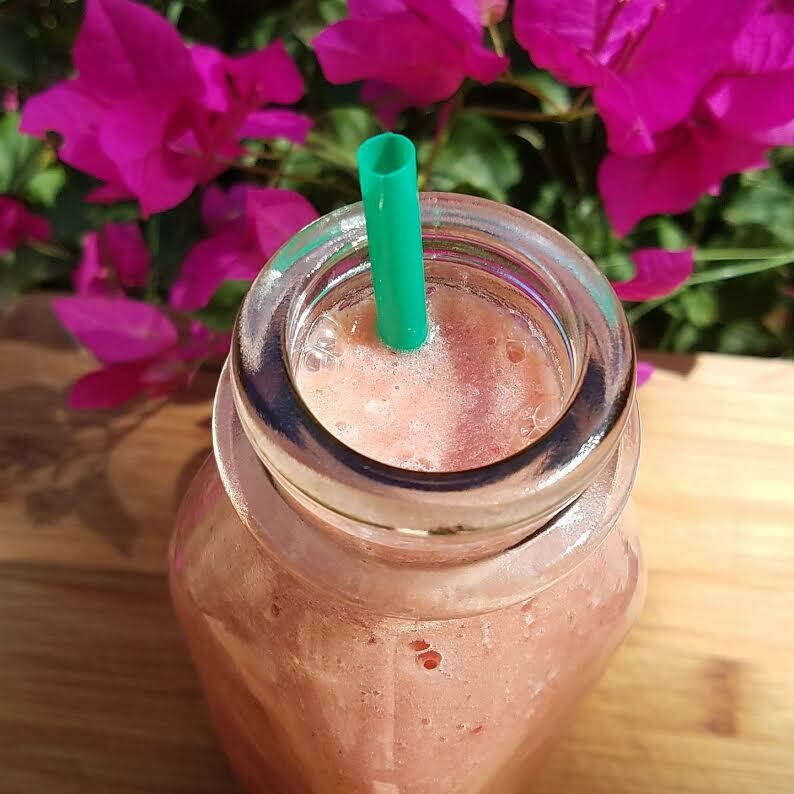 Cut 1/4 of a watermelon into chunks and put into your blender. Now add 1 cup of fresh strawberries and 1/2 up of frozen strawberries. Add 3 pitted medjool dates. Blend it up and serve! So this is absolutely delicious and very satisfying! Easy to make! Make sure you are stocking your kitchen full of fresh produce to be able to create any healthy meal in a breeze! Now mix your salad up! Dig in! Now that was easy right! Enjoy healthy food everyday to feel and look your best always! 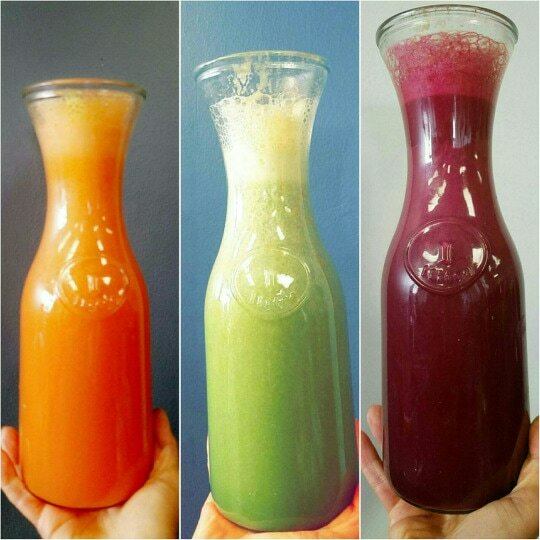 ​Juicing for life! Feel amazing and look your best! I put a grapefruit in this one but I recommend leaving it out. Spinach, Celery, Parsley, Lemon, Green Apple, Cucumber, Ginger root. Pick a large organic zucchini and peel the skin off. 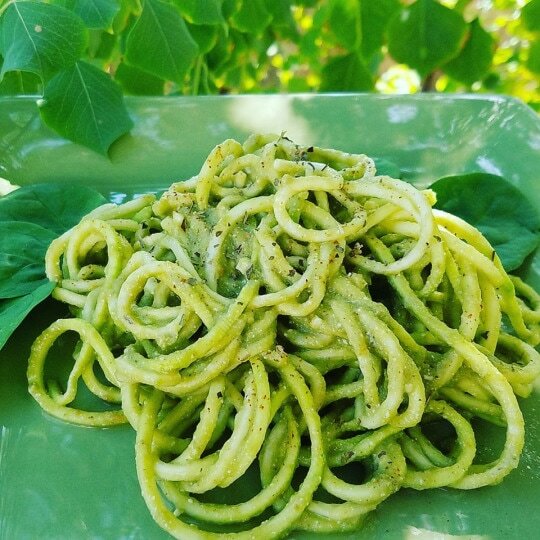 Next using a Spiralizer place your zucchini in and turn the knob to create noodles! Place your noodles in a bowl. ​Next make the yummy delicious dressing! Mix into your noodles and sprinkle on top Basil, Paprika, Onion Powder and a dash of sea salt. There you go! Eat green and feel vibrant! Get your Green Glow! Dairy free, gluten free, soy free! 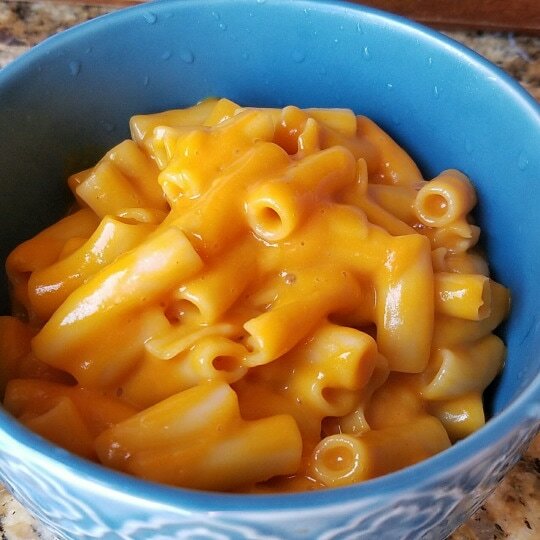 I have made this recipe super easy! I experimented quite a bit and really simplified it down and it taste so good! Steam 2 golden yellow potatoes and 2 medium sized carrots until a little soft but not squishy. Boil your gluten free brown rice or quinoa noodles until al dente. Strain out the liquid. Place your lightly steamed veggies into a blender. Now add the juice of ½ a lemon, ½ cup of nutritional yeast, 1/8 tsp of Himalayan pink sea salt, 2 tbl of Braggs Liquid Aminos, 1 tbl of onion powder, add a little almond or coconut milk enough to get it to blending up nice and creamy. Now pour this over your noodles mixing it in. Get healthy! Stay healthy! Life is delicious! And you are worth it! 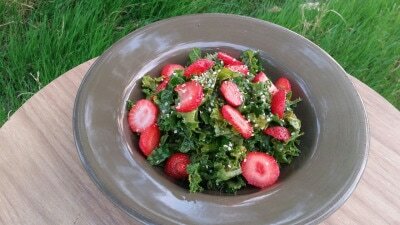 Strawberry Kale Salad with Creamy Mango Dressing and Dessert! I can’t explain how delicious and creamy this dressing was! 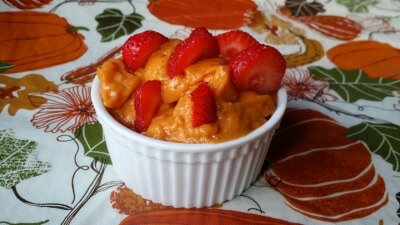 It can actually be served as a dessert pudding as I did here with cut up strawberries to dip with. So good! I used this dressing for my kale salad. I massaged it into the leaves then cut up fresh organic strawberries on top with sprinkles of hemp seeds! 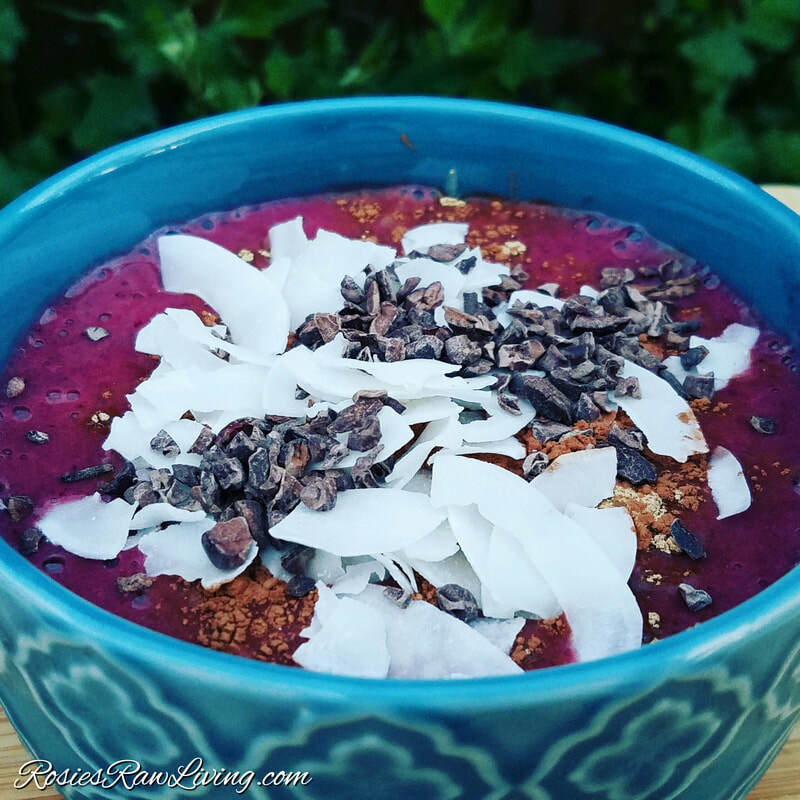 This meal is very nourishing and has a great balance of nutrients for the body. 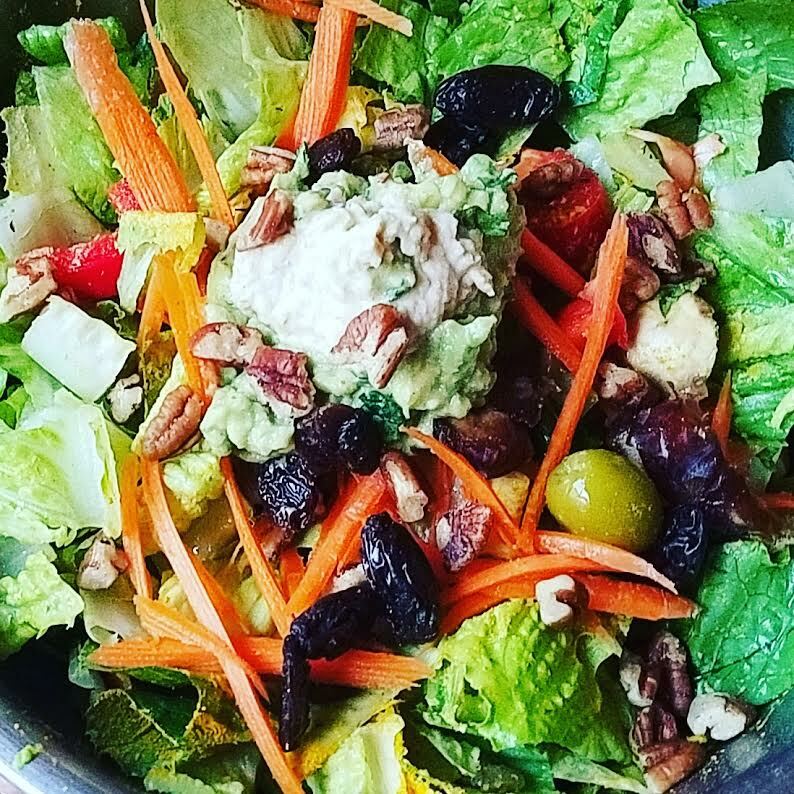 There is a little avocado in the dressing providing healthy Omega 6 and the hemp seeds with the healthy Omega 3 providing a nice balance of nourishment of healthy fats. ½ Avocado 1 Mango 2 Pitted Dates ½ Squeezed Lemon ¼ Bell Pepper Place all ingredients into a high speed blender and blend to a creamy consistency. Rinse your kale leaves and tear up into pieces, dry them a bit then massage in the dressing. Add the cut up strawberries and sprinkle on the hemp seeds. Viola! Enjoy a super tasty satisfying meal. Quinoa- Take 1 Cup of Red Quinoa and pour it into your pot of 2 cups hot water. Reduce to a lower heat and let cook for approximately 10-12 minutes until all of the water is absorbed and the Quinoa is fluffy. Let it cool a bit and add a bit of fresh squeezed lemon and lime, onion powder and a 1/2 TBL of Braggs Liquid Aminos or Himalayan Sea Salt to taste. Mix & Fluff. Guacamole- Mash up 2 Avocados and add Lemon/Lime to taste with Onion powder and a little Sea Salt of choice or omit the salt, it’s your choice. (You will have extra for a later meal). Veggies- Chop up Cucumbers, Tomatoes & Red Bell Pepper to sprinkle on top once you plate your meal. If you like Onion add them, as this takes it to another level of tastiness and nourishment! Kale Salad- Rinse and dry you organic kale. Chiffonade your kale then throw it into a bowl. Now add a little Avocado oil or Coconut oil (You can leave the oil out if you are oil free) as you squeeze and massage the kale leaves. Now add a fresh squeezed lemon as you continue to toss and massage the leaves. Next add in a little Himalayan or Black Sea Salt, Onion Powder, Pepper like seasoning and Dill and/or Basil. Taste as you go along as to amounts you desire of each flavor. Plate it up and enjoy! 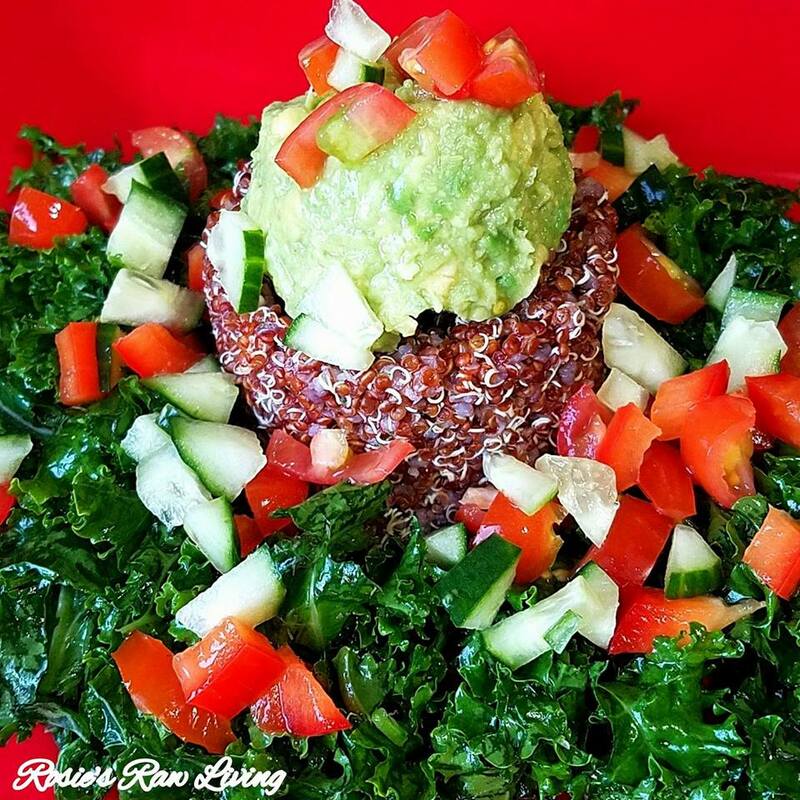 On your plate place your Kale and a few scoops of the Quinoa then your Guacamole and Veggies go on last. Dig in!